Nolini was born in Faridpur, East Bengal. While in his 4th year at Presidency College Calcutta, he joined the Maniktola secret society. In May 1908, at the age of 19 he was arrested for conspiracy in the Alipore Bomb Case. 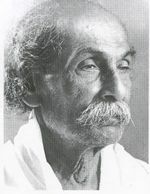 Acquitted in may 1909, he worked for about a year on the staffs of Dharma & Karmayogin, two Nationalist newspapers started by Sri Aurobindo, then travelled between Pondicherry and Calcutta. From 1926, when the Sri Aurobindo Ashram was founded, he settled permanently in Pondicherry serving the Mother & Sri Aurobindo dedicatedly (as Secretary of the Ashram and later as one of its Trustees) till he passed away. also: "Reminiscences" (with K.Amrita), "Evolution and the Earthly Destiny"
"Nolini: Arjuna of our Age" by Dr.V.M.Reddy and "Lights from Nolini Kanta Gupta"
Poems from "To the Heights"
from "About Woman" ( as quoted in the Auroville online weekly AV-News Issue 850 of 5 August 2000) (20 Kb) with an additional note by Ananda Reddy, editor. Ce texte paru en préface du "Guide du Yoga" est en réalité une compilation de différents articles et études.